TOXIC WALTZ is not only of the Thrash hits of the American formation EXODUS, it’s also the name of a new, German Thrash Metal band that was founded in 2009. Lead guitarist Jimi and ex-drummer Tim (who left the band in 2013) were at the basis of this. The band’s musical goal is inspired by the tunes of several Bay Area Thrash bands: EXODUS, HEATHEN, DARK ANGEL, etc.). Live-wise the Germans have already shared the stage with a.o. SIX FEET UNDER, ALPHA TIGER and DEBAUCHERY. Late in January 2014 a first release saw the light of day: the full length “Decades Of Pain”, on which several world problems are being tackled (politics, environment, war, …). The disc contains 9 tracks, totalling a playtime of under 40 minutes. It all begins with the intro, which is acoustic and builds and grows in power when its electric version, sounding rather hymnic. “Decades Of Pain” connects instantly with midtempo music. This serves to create tension, to pave the way for the outburst that is due. Once all chains are loose, it’s all about catchy Thrash with aggressive, low vocals. Backing vocals are delivered as well, by the book. The obligatory solos are set over halfway. Variation is offered, be it by the drums or the guitars. A good song to start with. The next track is also worth checking out: “World Of Hate”. This one is about direct action, though with slow, melodic building. Heavy riffing is key, allowing for lots of headbanging. Like before, the real outburst is afterwards with straight-forward verses and shouting vocals, linking with a midtempo chorus. Halfway all signs of Thrash disappear, to be replaced by an acoustic passage (harbouring a solo). Eh.. what? I had to listen a few times to appreciate this change, but still, it’s quite unexpected and rather abrupt, I’d say. Afterwards it’s back to business as usual, including a solo that fits the rest of the music. “Toxic Hell” starts melodically, yet adds a gloomy touch to the album. However, predictability soon reveals itself as an ICED EARTH-like riff comes peeping around the corner: the sign to pedal to the Metal. The low, greasy vocals are once more applied in this energetic track. So far for the highlights, in my opinion. “Suicide Squad” has a clean intro, comparable to METALLICA (“One”, “Welcome Home (Sanitarium)”, …), leading into ballad-like instrumental music. The power is activated later, boosting in the verses and flowing fully in the chorus. There’s a solo before halfway and, to be honest, it’s strange to hear one at this point in the song. The rhythm guitar work is key, though, also for filling gaps. It may have its use, but there’s too much of it here. Ok, one more highlight then: “Green”. As you can imagine, it’s about the environment. Or rather, the decline. While the previous song faded out, this one fades in with a burst. To be replaced by a short acoustic piece, after which it’s Thrash time! Threathening, pounding, powerful and aggressive Metal. Of course, there’s a solo moment here, but the timing is so predictable, as in “And now, the solo.” The slowdown afterwards reminded me a little of “Heaven And Hell” (BLACK SABBATH). Then the band picks up the thread again and goes into powermode. “Morbid Symphony begins with chugging guitar work, leading into uptempo Thrash with the expected aggressive vocals. The chorus is a bit slower. Halfway, the band chose to play a different rhythmic piece preceding the next boost. It’s a rather boring filling, too predictable. Yes, I should use a synonym for that word. “Priest Of Lie” is a firm, straight-forward Thrasher with solos early-on as well as halfway, whereas the latter one is preceded by a rhythmic, headbang-friendly part. But fear not, for wild, violent Thrash is foreseen later on. Last but not least, but not a highlight either, is “Obsession To Kill”. Slow building at first, then midtempo Thrash with growling and screaming vocals. This aspect is changed into clean singing in the chorus, where backing vocals enhance this element. Young bands reviving old school Thrash: there are truckloads of such bands out there (EVILE, HAVOK, WOSLOM, NERVOSA, etc. 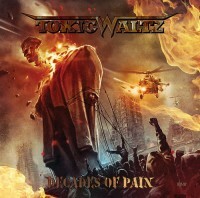 ), and now TOXIC WALTZ rises to the surface with “Decades Of Pain”. Yes, the Bay Area influences are present. However, the compressed production is partly cause for the listening experience not being totally satisfying. But that’s a detail compared to the songs themselves. Take out the better/best ones and you’ll have a nice EP. Still, I had a hard time feeling the music, appreciating it all. The album leaves much to be desired. Also, several songs have the same structure, sounds rather simple compared to what other bands provide on their releases. But as it’s a first album, maybe the follow-up could be entirely different and more convincing.